Abstract: The i848P's feature set is almost identical to that of the i865PE except for one thing, there is only one 64 bit memory controller instead of two. Let's be frank about this, who wouldn't want to have the best equipment in their PC? I'm going to be buying a new car soon and I'd love to get a Porsche... but my budget doesn't allow that. For the average consumer, most view buying a PC hardware in much the same way - they want the fastest gear, but then reality sets in. So what are the options? Well for one, a motherboard based on the newly introduced Intel i848P chipset could work. The i848P's feature set is almost identical to that of the i865PE except for one thing, there is only one 64 bit memory controller instead of two. That means the i848P has half the bandwidth of the i865PE at any given time, and is more suitably targeted towards value conscious consumers. Other than that, the feature set of the i848P and i865PE are virtually the same; both have 8x AGP, CSA support, etc. Though i848P's silicon is physically larger than that of the i845PE, it is the same size as the i865PE chipset. Today we're going to be checking out Albatron's PX865PE Lite Pro. 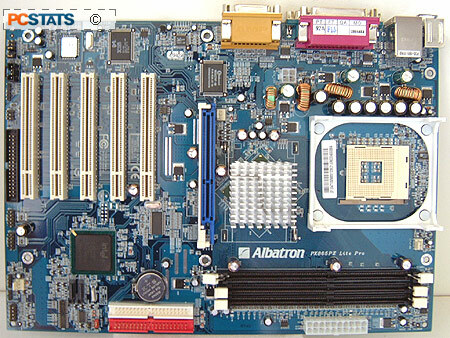 Obviously the board is based on the i848P/ICH5 and as such, it supports any 400/533/800 MHz FSB Pentium 4 processors. The three memory DIMM slots can accommodate up to 2GB of up to PC3200 non-ECC DDR RAM. In terms of on board goodies, the PX865PE Lite Pro has 5.1 audio and a 3Com 10/100 NIC. Yes there's also Serial ATA, however since it's natively supported by the ICH5 Southbridge we no longer consider it an additional feature.